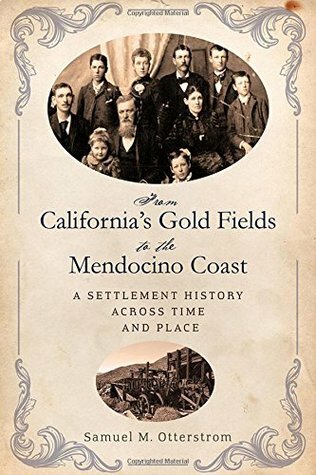 “Just as in the human body, where no atom or cell can act individually without affecting its surrounding elements, the history of nations has been written and shaped both by the most incongruous farmer and the exceptionally boisterous politician,” said Dr. Sam Otterstrom in his new book From California’s Gold Fields to the Mendocino Coast. In it, he examines the growth of the Golden State, it’s migration and settlement patterns, and the people who forged it. The way that individuals acted in these settings determined how and where the state grew. For example, families would move to California in search of gold, forming rough mining communities. These were often short-lived however, as miners were continually on the move: looking for better opportunities or ways to escape their harsh lifestyle. Cities were formed around the mining industry, particularly Sacramento and San Francisco. “In this way, all of northern California was intertwined and interrelated in the nearly living regional organism that matured into and economically innovative and increasingly dynamic spatial system,” says Dr. Otterstrom. More often than not however, these trailblazers went unknown. In California, people had the opportunity to find gold and become wealthy; an ordinary man could transform his life almost overnight. Such seekers forever altered the land and forged California into the Golden State. While some mining towns faded from maps and memories, others developed into cities that still thrive today, despite constant and rapid in- and out-migrations. “The towns that survived and that have sizeable populations today were the ones that, very early on, fulfilled a variety of economic functions and thus were less dependent on mining,” said Otterstrom. Their resilience was due, in part, to their economic diversity, but also, he found to the number of post offices each town contained. Again, this demonstrates that, no matter where individuals found themselves geographically, they sought connection and viewed themselves, at least subconsciously as part of a greater whole. “Every individual matters. Every individual has a role to play. Every individual makes a difference,” said Jane Goodall. Nowhere is exemplified better than in Dr. Otterstrom’s From California’s Gold Fields to the Mendocino Coast. In it, one comes to understand the vital role of the individual in molding California into a singular state, one that is truly a sum of its parts. Previous PostDo We Devalue Housework?Next PostWhy do we Devalue Housework?